2018 was an interesting year for observing how consumer goods companies have started re-directing their attention towards their online product reviews as a new place where not only their businesses but their customers too, could benefit from. On one hand, this year we’ve seen companies eager to discover what their consumers tell the market to expect from their products. They are looking forward to understanding their consumers’ feedback relative to their advertised promise and in comparison to competing products, be them their own or other competitors’. On other hand, we’ve seen companies focusing on ensuring immediate customer support by taking their negative product reviews from online stores, marketplaces and mobile apps right to their key support channels (slack or zendesk) and treating them as direct customer complaints. Replying to their consumer negative product reviews with the intention of solving the dissatisfaction caused as well as showing their proactiveness behind the online shelf has become a top priority. From consumer electronics, apparel, baby care and beauty global brands to local companies hyperspecialized in niche products or more innovative IoT startups, teams of product management and R&D, customer acquisition, marketing and procurement up to the executive management and investor boards – everyone has become genuinely interested in finding out how their products are being perceived in the marketplace through the voice of their buyers. The need for taking action towards adopting a more consumer-centric approach and building the grounds for consumer loyalty has become visceral. Thus, these companies decided to embark on a discovery journey which the earlier one starts, the more benefits one gets on the long run. Year on year consumer preferences change, new competitor products are launched in the marketplace, new consumers appear on the horizon and share their product experiences with their peers. How then not hear what buyers say out and loud? What is the value of data without being able to mine it according to your own needs? 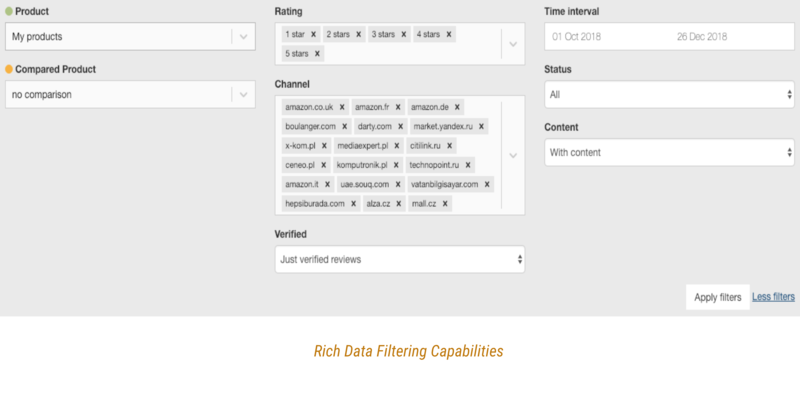 Starting this year, our customers benefit of a rich product review filtering feature which helps them dig into their product reviews across a number of dimensions such as timeframe, ratings, store channels, content, real-buyer signature. This was a significant step ahead which helps brands look at their product reviews from multiple angles. When you work with multi-dimensional data – such as product review data is that has value and meaning only when it’s accompanied by other attributes such as store channel, product review rating, timeframe, review text, title etc – the need for viewing the data in different ways for a thorough evaluation is always best supported by Excel reports. Starting this year, FeedCheck has introduced an Excel export feature for all its comparative reports that give you an overview of all reviews by product, store channel or specific grouping relevant to your brand and business. Setting up a new FeedCheck account or adding new items to your existing product listing should start with the whole review history from the online product launch date until the present moment. The Quick Check feature allows users to – as its name says – quickly aggregate all past reviews from any store channel or website in one place. Thus, one could easily get access to the past review and rating trends and make sense of the voice of the buyers’ data over the past relevant time periods. Our large global customers manage online listings of tens of products, either their own or competitors’, that they need to monitor reviews for across multiple store channels. For such rich product listings, they need to get a clear overview of which products they monitor reviews for on each store channel. As some companies may opt to bring into FeedCheck product reviews from their own websites or need to decide on which products they want to take out and swap them for other new items, a product & channel cross-reporting assists them solving that on the spot. For companies that need to enrich their supply chain analysis with external sets of data such as product reviews and ratings, the newest FeedCheck API is now fully contributing to that and does it in a fully automated way. Adding and removing products from FeedCheck and bringing in relevant product review data is done through the API on your schedule based on your own programming rules. Either you’re a consumer goods brand, a software or market research company, the FeedCheck API is ready to deliver your product review data right into your internal systems. With these new functionalities on board and many more to come in 2019, FeedCheck is ready to welcoming from large consumer goods global brands to local niched but powerful startups that sell their products online and help them with the product review aggregation and monitoring setup that serves best their needs and desires in the new year.